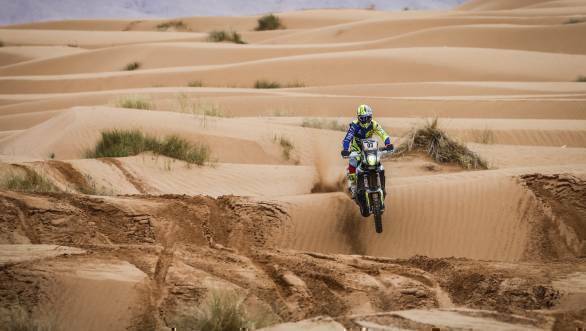 The second stage of the 2019 Merzouga Rally went well for both Indian teams competing in the event. Sherco TVS rider Michael Metge led the way, ranked second overall after the second stage. Hero MotoSports Team Rally's Joaquim Rodrigues was classified third overall after the rally's second competitive stage. The 212km long special stage was divided into two parts. The first 86km long stretch took riders through the dunes of the Erg Chebbi, and the second part of the stage was over the mountains with tricky navigation. It was a particularly good stage for the Sherco TVS team, with Michael Metge topping the stage. Abdul Wahid Tanveer ended the stage 23rd. This meant that Metge was ranked second overall after the second stage of the rally. 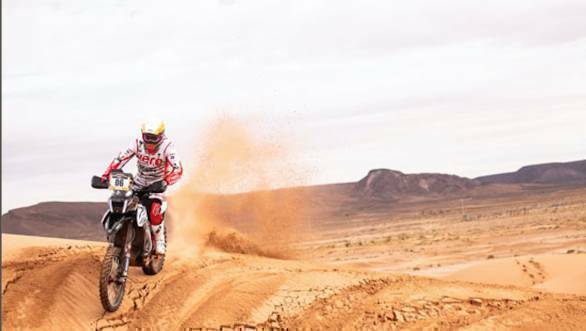 Aravind KP wasn't able to complete stage 2 of the rally due to technical issues with his motorcycle, which led to a 67th place overall after two stages. The Indian rider had also suffered issues with his bike on the first stage, but managed to bring the bike back home to the finish. He is currently continuing to ride, despite a massive penalty. The Hero MotoSports Team Rally outfit also had a good outing during Stage 2. Oriol Mena finished the stage second, which put him fifth overall in the rankings after the second stage. Joaquim Rodrigues, who finished the stage fourth, was ranked third overall after two stages in the rally. The riders are now embarking on Stage 3, the first part of a two-day marathon stage that will see them camp in the middle of the Moroccan desert.